I was 8 weeks and 2 days in this picture. I had an early scan because I had some bleeding at 7 weeks, and suspected miscarriage, but instead of finding that we had lost a baby, we discovered that we were having TWO! The same exact thing happened to me. I am currently 8 weeks and 5 days. I went to the ER for vaginal bleeding thinking I was having a miscarriage and found out I am having twins. My babies are in two yolk sacs but seprated by internal fetal poles. I think I'm having identical twins based of my nursing knowledge. Good luck to both of you or congrats (depending on how old this post is)! It looks like you only have one yolk sac....is that the case? 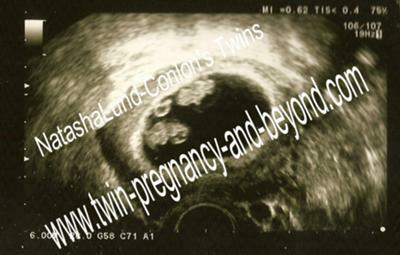 I was told by my tech that I had one yolk sac, but two fetal poles, which is mono-mono twins, but she never specifically said twins.... I asked her what she was measuring and she said "oh those are the fetal poles" which I didn't think much of at the time. I assumed there was suppose to be two.... now I'm wondering.